The composer Mario Nascimbene, most famous for composing the music for more than 150 films, was born on this day in 1913 in Milan. Nascimbene’s legacy in the history of Italian cinema is inevitably overshadowed by the work of Ennio Morricone and the late Nino Rota, two composers universally acknowledged as giants of Italian film music. Yet the trailblazer for the great Italian composers of movie soundtracks was arguably Nascimbene, whose engagement to score Joseph L Mankiewicz’s 1954 drama The Barefoot Contessa won him the distinction of becoming the first Italian to write the music for a Hollywood production. It was such an unexpected commission that Nascimbene confessed in an interview in 1986 that when he was first contacted about the film by Mankiewicz’s secretary he shouted down the phone and hung up, suspecting a hoax perpetrated by a friend who only a few months earlier had caught him out in a similar wind-up over the score for the William Wyler movie Roman Holiday. Only after a third call from the secretary did he reluctantly agree to meet the director and when his doorbell rang he was convinced his friend would be on the other side as before, only to fling it open and find Mankiewicz standing on his front step, ready to explain that he had been impressed by his work in Italian cinema and did indeed want to hire him. 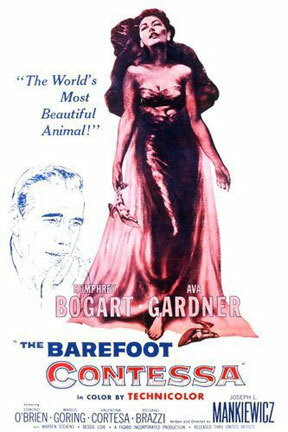 The Barefoot Contessa, starring Humphrey Bogart, Ava Gardner and Edmond O’Brien, won an Oscar for O’Brien as Best Supporting Actor and was a box office hit, gaining Nascimbene a level of exposure he had never before known. More work in America soon came his way and more success, his scores for Robert Rossen’s Alexander the Great, starring Richard Burton and Claire Bloom, A Farewell to Arms, starring Rock Hudson and Jennifer Jones, Mankiewicz’s The Quiet American, starring Audie Murphy and Michael Redgrave, and The Vikings, a swashbuckling romp starring Kirk Douglas, establishing his reputation. He cracked the British market, too, with his commission to score the 1959 movie Room at the Top, directed by Jack Clayton and nominated for six Academy Awards, winning Best Actress for Simone Signoret and Best Adapted Screenplay for Neil Paterson. Nascimbene himself won three Nastro d'Argento awards for best score for Rome 11:00 (1952), Violent Summer (1960) and for Pronto... c'è una certa Giuliana per te (1968). In 1991, Nascimbene was awarded a "Career David" from the David di Donatello Awards, honouring his lifetime achievements. Born in Milan, Nascimbene attended the "Giuseppe Verdi" Conservatory of Music under the guidance of Ildebrando Pizzetti, studying composition and orchestral conducting. After graduating, he wrote several pieces of chamber music and a ballet. His first film work came in 1941 for the Italian movie Love Song and the success of that project encouraged him to concentrate his energy on the cinema, where he came to be regarded as one of the finest movie composers of his lifetime. Nascimbene was particularly appreciated for inventing ‘Mixerama’, a revolutionary style that allowed him to incorporate into his scores the sounds of non-orchestral instruments, such as the jaw harp and harmonica, and even everyday noises such as the ticking of a clock, the ring of a bicycle bell or, famously, the clacking of typewriters in Giuseppe de Santis’s neorealist Rome 11:00. Having worked briefly but successfully with Federico Fellini on Amore in Città (Love in the City) in 1953, he was disappointed that Fellini eventually chose Rota as his favoured composer, but established good relationships of his own with De Santis and Roberto Rossellini, composing the score for the latter’s 1975 epic The Messiah. Nascimbene, who also did some work in contemporary opera and jazz music, was twice married. 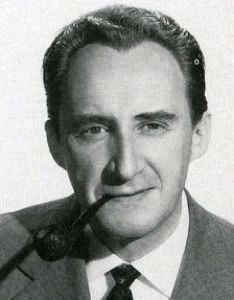 He died in Rome in 2002 at the age of 88. 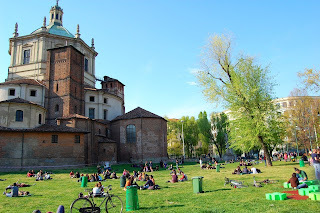 One of the quirkier attractions in Milan can be found to the east of the city centre at the centre of a block just beyond Porta Vittoria, bordered to the south by Corso XXII Marzo and to the north by Corso Indipendenza. 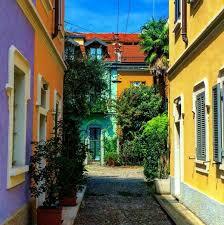 Running parallel with Via Pasquale Sottocorno and accessed from Via Benvenuto Cellini, the narrow, tree-lined Via Abramo Lincoln is the most unusual street in the context of the city, a collection of small, terraced houses, each painted a different colour from its neighbour. It has the feel of London’s Notting Hill and is all that exists of a dream of a workers’ co-operative in the late 19th century to create an area of small, affordable houses which, largely because of economic turmoil and the First World War, never progressed beyond a single street. Another less well-known place to visit in Milan is the Parco Papa Giovanni Paolo II, not far from the Navagli canal district in an area known as Ticinese, a stretch of green public space that links to basilicas, the Basilica of Sant’Eustorgio to the south and to the north the magnificent Basilica of San Lorenzo Maggiore, with its Corinthian columns left behind from a 3rd century Roman temple.